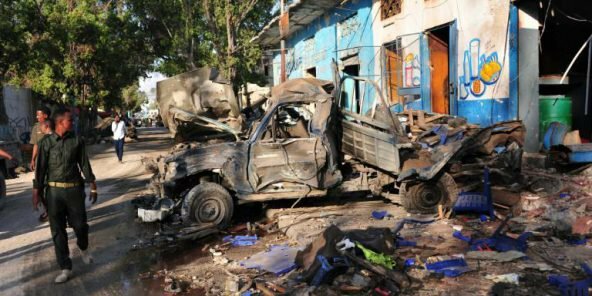 The Somali government Sunday ended functions of police commander General Abdihakin Dahir Saiid and director general of the National Intelligence Security Agency (NISA), Abdullahi Mohamed Ali following another terror attack in capital Mogadishu which left 29 people dead, two weeks after truck-bombing killed over 300 people. The cabinet decision announced by state-run radio station following an attack on a hotel in the capital followed by a siege which ended 10 hours after confrontation between al Shabaab militants and security forces. The militants in early Saturday morning drove a car bomb through the gate of Nasahablod Two hotel, near the Presidential palace. President Mohamed Abdullahi Farmajo was due to hold a meeting with the leaders of the country’s five federal states in the hotel in later afternoon. After the car destroyed the gate, a group of other militants stormed the hotel and took workers and civilians hostage. Security forces only broke the siege after 10 hours of gun battle. The ministry interior said two of the attackers were killed while three have been made captives. Most victims were members of security forces, the ministry further noted. The militants group which seeks to ouster the UN-backed government said 40 people had been killed noting only three of its fighters stormed the hotel. Two weeks ago, the Islamic State affiliate group Al Shabaab was suspected for a truck bombing on October 14, in the central Mogadishu. Over 300 people were killed and at least 200 injured in what became the worst attack witnessed by the country which still houses 22,000 international forces supported by the UN and the African Union (AU).